The race for promotion to the Premier League is hotting up with the Easter weekend fixtures set to prove a key moment in the play-off battle. With Norwich, Leeds and Sheffield United all guaranteed a spot in the play-offs there are still three positions still up for grabs. We examine Middlesbrough’s run-in and their play-off hopes plus those of their rivals. West Brom. 4th. 73 points. When you have one of the deadliest strike partners in the league you are always gonna be high up the table. Jay Rodriguez and Dwight Gayle have been a deadly force in the Championship and despite sacking Darren Moore last month, the play-off position seems to be a certain because if they beat Hull on Friday they will be guaranteed a spot. If Hull do spoil the party at the Hawthorns they have very much winnable games coming up as they face relegation strugglers Reading and Rotherham. Aston Villa. 5th. 69 points. It took a while for Dean Smith and his Villa side to get to full speed but they have found great form in the crack of time. If Aston Villa don’t mess up against Bolton who are a club in disarray at the minute and Millwall. It should be enough to get them over the line before they finish the season with two of the hardest challenges in the Championship who are likely to be fighting for the title until the very last day. Bristol City. 6th. 65 points. Sixth place is where the battle is. Unfortunately for Middlesbrough, Bristol City have a game in hand and the Teessiders will be hoping the Robins stumble. They don’t have it so easy though with away clashes with Sheffield Wednesday and Hull and a home match against Derby which will heat up the chase for the chance to go to Wembley. However, the Robins have been in great form beating the likes of West Brom but how will they react to their defeat against Aston Villa. 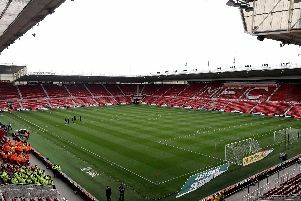 Despite what seems to have been a disappointing season at the Riverside, Middlesbrough are still in with a chance to reach the play-offs. Stoke will be a huge game on Friday and if Middlesbrough lose it may all be over, however, at times like this everyone hopes for a bit of luck and if Bristol City lose who knows how the season will end up and it could go all the way to the end for an exciting match away at Rotherham. Derby County. 8th. 63 points. Like Bristol City, Derby have a game in hand over Boro but there fixture list is certainly looking a lot harder than their rivals. Bristol City and West Brom will be a difficult test for Frank Lampard and his young squad as well as Monk’s Birmingham who might have been fighting for the play-off position had they not been deducted points earlier in the season and managerless QPR have turned up the heat since Steve McClaren’s sacking as they beat Swansea 4-0 last time they played. Hull City. 9th. 60 points. Nigel Adkins has done wonders with this Hull side and will be hoping for more wonders as they have the hardest run in than any of the other Championship sides fighting for the play-off spots. West Brom, Sheffield United and Bristol City are all fighting for something and will be hard to beat and Swansea are no walk over as Middlesbrough found out when they visited the Liberty Stadium as they lost 3-1.